My work is very much concerned with the simplicity and beauty of the clay and incorporating pattern and texture as well as glaze to create subtle, unique variations. Thinness and movement are very important in each piece. 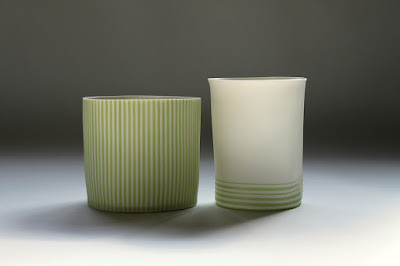 I am also fascinated by the transforming effect of light on the physical properties of porcelain. When a simple object is illuminated from within, subtle details become apparent and an ‘atmosphere‘ is created that transcends the object’s mere functionality.